At the grand opening of the Mall of Scandinavia on the 12th of November, tens of thousands of shoppers enjoyed a world class retail experience where lighting design had been given centre stage. This is the culmination of a five year close cooperation between ÅF Lighting and Wingårdh Architects. 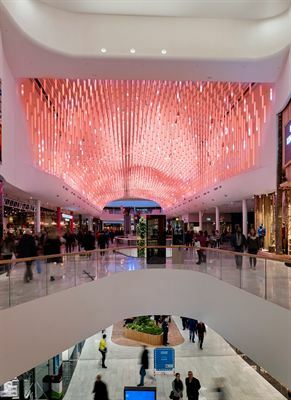 ÅF's lighting team has designed the lighting for all public spaces throughout the building, from the functional illumination of the underground parking spaces to the extravagant light features in entrances, piazzas and along walkways.